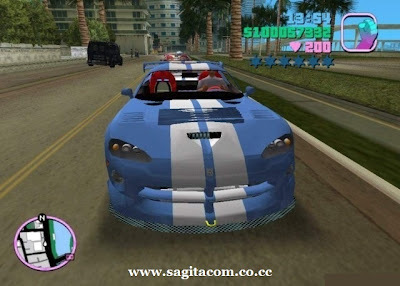 SAGITA COM - This is a mod for Grand Theft Auto: Vice City that adds 40 real cars, a new bridge, new billboards and more. Everything is included in an automatic installer. New cars in Version 2.0: Washington = BMW 850; SandKing (Sunshine Auto) = Ford F-150; Sanchez (moto)= Yamaha YZ 450; Virgo = Porshe 911 Turbo; Sentinel XS = Vector M12; Regina = Lotus Elise GTR; Admiral = Nissan Skyline (Handling probleme in beta version); BF Injection = BMW Hamann; Oceanic = Toyota Supra Turbo; GreenWood = Nissan R390 GT1; Rumpo = Toyota Supra (Fast and Furious); Faggio = Shop Cart; Pheonix = Bugatti Veyron Concept 2004; Walton = Opel Speedster; Blista Compact = Ford TS 50; Moonbeam = Mercedes SL600; Mesa Grande = Ferrari 550 Barchetta; and Glendale = Dodge Charger. Other cars: Infernus = Lamborghini Diablo; Cheetah = ferrari F40; Banshee = Lamborghini Murcielago; Hunter = Harrier; Stinger = Chevrolet Camaro SS; PCJ 600 = Ducati 1000; Hermes = Toyota GT-ONE; Deluxo = Mitsubishi Eclipse (2 fast 2 furious); Taxi = Peugeot 406 Taxi (Taxi 3); Sentinel = Mistubishi Galant; Hotring = Ford Mustang SVT Cobra; Idaho = Dodge Viper GTS; Landstalker = Ford Explorer; Rancher = Jeep Grand Cherokee; Comet = Ferrari 360 Spider; Stallion = Toyota Black Supra; Manana = Subaru Impreza WRX; Sabre = Ford boss 1971; Esperant = Ford GT-40; Police = Police Ford Crown Victoria; Sabre Turbo = Ford Shelby Mustang GT500 1967; and Perenial = Honda NSX ULTIMATE 2000 (Ultimate Vice City Bonus). You will need to have the full PC version of Grand Theft Auto: Vice City in order to install this mod. You need a fresh install of Vice City to install this mod or it will not work. If you have Ultimate Vice City 1.1 installed, you must uninstall Grand Theft Auto: Vice City, re-install Vice city, then install Ultimate Vice city 2.0.